Businesses highly conscientious about the sanitation of their work practices and processes need to become more confident that these do not contribute to human illness. TRSA’s Hygienically Clean certification helps achieve this objective by ensuring textile products laundered for businesses meet key disinfection criteria. A TRSA Hygienically Clean certified operation washes, dries, irons and packs items using techniques to produce laundry that meets TRSA’s cleanliness specifications. 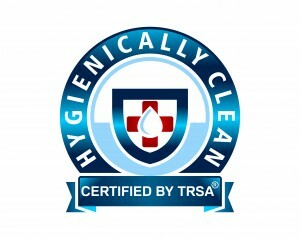 TRSA also offers a Hygienically Clean – Healthcare certification and will develop a Hygienically Clean – Food Service standard. To earn these laundries must meet the baseline qualifications for the Hygienically Clean designation and specialized criteria for these additional designations described on their webpages on this site. A laundry is not required to use particular processes, chemicals or BMPs to achieve certification—whatever tactics management feels are necessary can be used to achieve TRSA’s Minimum Performance Specifications as measured by bacteriological testing. But BMPs must be documented in a written quality control manual. To approve laundries for Hygienically Clean certification TRSA inspects them to review their documentation and observe their BMP deployment. After this initial on-site inspection, facilities are examined on a 3-year basis. Bacteriological testing begins with one evaluation in each of the first three months the laundry is certified, then one every six months.